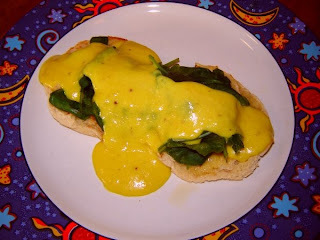 In keeping with my "30 DAYS OF VEGAN GRAVY" quest for Vegan Month of Food Blogging, I'm re-posting one of my most-requested recipes: Vegan Hollandaise!! Hollandaise is food of the gods, I'm sure, and it's almost "gravy"-like, I figure, right? I have been on a quest for the perfect vegan Hollandaise for several years now and I think this is close to perfect, but now, I have to admit I don't remember what "real" Hollandaise tastes like. I can assure you it is buttery-lemony-eggy delicious though, (OK, tooting my own horn, sorry) but if you're missing Hollandaise, give this a try. If it DOESN'T THICKEN satisfactorily for you, add 2 teaspoons cornstarch to a little soymilk and mix in to sauce, stir with wire whisk over heat until it thickens. This sounds FANtastic. I will definitely be making it, and will report back! ANY time I a see a vegan benedict on a menu, I order it. Thanks for the recipe, it looks amazing! Oooh that looks SO good, I'll definitely be trying out your recipe. That looks like a mighty fine hollandaise. I don't think I've ever had hollandaise sauce. This looks yummy. You're doing a great job with your gravy recipes (I really like the sound of the bean gravy! ); keep up the good work!